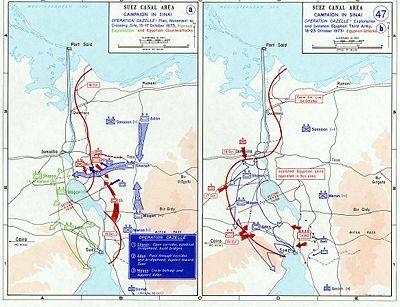 The Yom Kippur War, Ramadan War, or October War (Hebrew: מלחמת יום הכיפורים; (Romanization of Hebrew transliteration) Milkhemet Yom HaKipurim or מלחמת יום כיפור, Milkhemet Yom Kipur; Arabic: حرب أكتوبر; (Arabic transliteration) ħarb October or حرب تشرين, ħarb Tishrin), also known as the 1973 Arab-Israeli War and the Fourth Arab-Israeli War, was fought from October 6, to October 26, 1973, between Israel and a coalition of Arab nations led by Egypt and Syria. The war began on the Jewish holiday of Yom Kippur with a surprise joint attack by Egypt and Syria crossing the cease-fire lines in the Sinai and Golan Heights, respectively, which had been captured by Israel in 1967 during the Six-Day War. 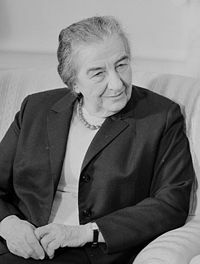 During the Fall of 2003, following the declassification of key Aman documents, Yedioth Ahronoth released a series of controversial articles which revealed that key Israeli figures were aware of considerable danger that an attack was likely, including Golda Meir and Moshe Dayan, but decided not to act. The two journalists leading the investigation, Ronen Bergman and Gil Meltzer, later went on to publish Yom Kippur War, Real Time: The Updated Edition. Territory gained by Israel during the Six-Day War was initially regained by Egypt and Syria, then lost again. The war had far-reaching implications for many nations. The Arab world, which had been humiliated by the lopsided defeat of the Egyptian-Syrian-Jordanian alliance during the Six Day War, felt psychologically vindicated by its string of victories early in the conflict. This vindication paved the way for the peace process that followed, as well as liberalizations such as Egypt's infitah policy. The Camp David Accords, which came soon after, led to normalized relations between Egypt and Israel—the first time any Arab country had recognized the Israeli state. Egypt, which had already been drifting away from the Soviet Union, then left the Soviet sphere of influence almost entirely. Anwar Sadat was able to change tactics, and sue for peace with Israel with dignity. The war was part of of the Arab-Israeli conflict, which began in 1948. 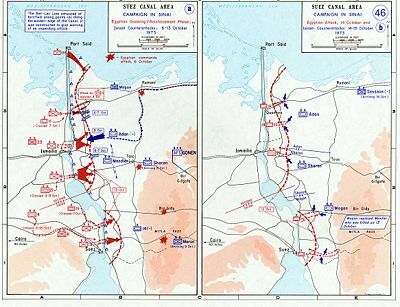 During the Six-Day War, six years earlier, the Israelis captured the Sinai clear to the Suez Canal, which had become the cease-fire line. The Israelis had also captured roughly half of the Golan Heights from Syria. In the years following that war, Israel erected lines of fortification in both the Sinai and the Golan Heights. In 1971 Israel spent $500 million fortifying its positions on the Suez Canal, a chain of fortifications and gigantic earthworks known as the Bar Lev Line, named after Israeli General Chaim Bar-Lev. Although the Israeli government secretly decided to return the land in return for peace, this was never communicated to Egypt and Syria and the decision was later rescinded. The decision was kept a closely-guarded secret within Israeli government circles and the offer was withdrawn in October, 1967. Egypt and Syria both wanted a return of the land they had. However, the Khartoum Arab Summit issued the "three nos"—there would be "no peace, no recognition, and no negotiation with Israel." When President Gamal Abdel Nasser of Egypt died in 1970 he was succeeded by Anwar Sadat, who resolved to fight Israel and win back the territory lost in the Six-Day War. In 1971, Sadat, in response to an initiative by UN intermediary Gunnar Jarring, declared that if Israel committed itself to "withdrawal of its armed forces from Sinai and the Gaza Strip" and to implementation of other provisions of UN Security Council Resolution 242 as requested by Jarring, Egypt would then "be ready to enter into a peace agreement with Israel." Israel responded that it would not withdraw to the pre-June 5 1967 lines. Sadat hoped that by inflicting even a limited defeat on the Israelis, the status quo could be altered. Hafiz al-Assad, the head of Syria, had a different view. He had little interest in negotiation and felt the retaking of the Golan Heights would be a purely military option. Since the Six Day War, Assad had launched a massive military build up and hoped to make Syria the dominant military power of the Arab states. With the aid of Egypt, Assad felt that his new army could win convincingly against the Israeli army and thus secure Syria's role in the region. Assad only saw negotiations beginning once the Golan Heights had been retaken by force, which would induce Israel to give up the West Bank and Gaza, and make other concessions. Sadat also had important domestic concerns in wanting war. "The three years since Sadat had taken office… were the most demoralized in Egyptian history… A desiccated economy added to the nation's despondency. War was a desperate option." Sadat badly wanted to introduce economic reforms but hesitated to do so without reversing the humiliation of defeat in the Six Day War. Without this, he did not think that the Egyptian people would tolerate economic change, even though the economy was unhealthy. Other Arab states showed much more reluctance to fully commit to a new war. King Hussein of Jordan feared another major loss of territory as had occurred in the Six-Day War, during which Jordan was halved in population. Sadat was also backing the claim of the PLO to the territories (West Bank and Gaza) and in the event of a victory promised Yasser Arafat that he would be given control of them. Hussein still saw the West Bank as part of Jordan and wanted it restored to his kingdom. Moreover, during the Black September crisis of 1970 a near civil war had broken out between the PLO and the Jordanian government. In that war Syria had intervened militarily on the side of the PLO, leaving Assad and Hussein estranged. Iraq and Syria also had strained relations, and the Iraqis refused to join the initial offensive. Lebanon, which shared a border with Israel, was not expected to join the Arab war effort due to its small army and already evident instability. The months before the war saw Sadat engage in a diplomatic offensive to try to win support for the war. By the fall of 1973 he claimed the backing of more than a hundred states. These were most of the countries of the Arab League, Non-Aligned Movement, and Organization of African Unity. Sadat had also worked to curry favor in Europe and had some success before the war. Britain and France had for the first time sided with the Arab powers against Israel on the United Nations Security Council. Anwar Sadat in 1972 publicly stated that Egypt was committed to going to war with Israel, and that they were prepared to "sacrifice one million Egyptian soldiers." From the end of 1972, Egypt began a concentrated effort to build up its forces, receiving MiG-21s, SA-2, SA-3, SA-4, (Returned to the Soviet Union prior to the war), SA-6 and SA-7 Surface-to-air missiles (SAM), RPG-7s, T-55, and T-62 Tanks, and especially the AT-3 Sagger anti-tank guided missile from the Soviet Union and improving its military tactics, based on Soviet doctrines. Political generals, who had in large part been responsible for the rout in 1967, were replaced with competent ones. The role of the great powers was a major factor in the outcome of the two wars. The policy of the Soviet Union was one of the causes of Egypt's military weakness. President Nasser was only able to obtain the material for an anti-aircraft missile defense wall after visiting Moscow and pleading with the Kremlin leaders. He claimed that if supplies were not given, he would have to return to Egypt and tell the Egyptian people Moscow had abandoned them, and then relinquish power to one of his peers who would be able to deal with the Americans. Washington would then have the upper hand in the region, which Moscow could not permit. Nasser's policy following the 1967 defeat conflicted with that of the Soviet Union. The Soviets sought to avoid a new conflagration between the Arabs and Israelis so as not to be drawn into a confrontation with the United States. The reality of the situation became apparent when the superpowers met in Oslo and agreed to maintain the status quo. This was unacceptable to Egyptian leaders, and when it was discovered that the Egyptian preparations for crossing the canal were being leaked, it became imperative to expel the Russians from Egypt. In July 1972, Sadat expelled almost all of the 20,000 Soviet military advisers in the country and reoriented the country's foreign policy to be more favorable to the United States. The Soviets thought little of Sadat's chances in any war. They warned that any attempt to cross the heavily fortified Suez would incur massive losses. The Soviets, who were then pursuing détente, had no interest in seeing the Middle East destabilized. In a June 1973, meeting with U.S. President Richard Nixon, Soviet leader Leonid Brezhnev had proposed Israel pull back to its 1967 border. Brezhnev said that if Israel did not, "we will have difficulty keeping the military situation from flaring up"—an indication that the Soviet Union had been unable to restrain Sadat's plans. The Egyptians did much to further this misconception. Both the Israelis and the Americans felt that the expulsion of the Soviet military observers had severely reduced the effectiveness of the Egyptian army. The Egyptians ensured that there was a continual stream of false information on maintenance problems and a lack of personnel to operate the most advanced equipment. The Egyptians made repeated misleading reports about lack of spare parts that also made their way to the Israelis. Sadat had so long engaged in brinkmanship, that his frequent war threats were being ignored by the world. In May and August 1973, the Egyptian army had engaged in exercises by the border and mobilizing in response both times had cost the Israeli army some $10 million. King Hussein of Jordan declined to join Egypt and Syria. On the night of September 25, he secretly flew to Tel Aviv to warn Israeli Prime Minister Golda Meir of an impending Syrian attack. "Are they going to war without the Egyptians," asked Mrs. Meir. The king said he didn't think so. "I think they [Egypt] would cooperate." Surprisingly, this warning fell on deaf ears. Golda Meir, Moshe Dayan, and Israeli general David Elazar met at 8:05 a.m. the morning of Yom Kippur, 6 hours before the war was to begin. Dayan began the meeting by arguing that war was not a certainty. Elazar then presented his argument, in favor of a pre-emptive attack against Syrian airfields at noon, Syrian missiles at 3:00 p.m., and Syrian ground forces at 5:00 p.m. European nations, under threat of an Arab oil embargo and trade boycott, had stopped supplying Israel with munitions. As a result, Israel was totally dependent on the United States to resupply its army, and was particularly sensitive to anything that might endanger that relationship. Some claim that in retrospect the decision not to strike first was actually a sound one. While Operation Nickel Grass, the American airlift of supplies during the war which began October 13, did not immediately replace Israel's losses in equipment, it did allow Israel to expend what it did have more freely. Had they struck first, according to Henry Kissinger, they would not have received "so much as a nail." The Egyptian units would not advance beyond a shallow strip for fear of losing protection of their SAM missile batteries. In the Six Day War, the Israeli Air Force had pummeled the defenseless Arab armies. Egypt (and Syria) had heavily fortified their side of the cease-fire lines with SAM batteries, against which the Israeli Air Force had no effective countermeasures. Israel, which had invested much of its defense budget building the region's strongest air force, would see its air force rendered almost useless by the presence of the SAM batteries. Anticipating a swift Israeli armored counterattack, the Egyptians had armed their first wave with unprecedented numbers of man-portable anti-tank weapons—Rocket propelled grenades and the more devastating Sagger missiles. One in every three Egyptian soldiers had an anti-tank weapon. "Never before had such intensive anti-tank fire been brought to bear on the battlefield." In addition, the ramp on the Egyptian side of the canal had been increased to twice the height of the Israeli ramp, giving them an excellent vantage point from which to fire down on the Israelis, as well as any approaching tanks. The Egyptian army put great effort into finding a quick and effective way of breaching the Israeli defenses. The Israelis had built large barricades made primarily from sand. Egyptian engineers initially used explosive charges to clear the obstacles, before a junior officer proposed using high pressure water cannons. The idea was tested and found to be a sound one, and several high pressure water cannons were imported from Germany. The Egyptian forces used these water-cannons loaded with water from the Suez Canal. The water-cannons effectively blasted away the barricades. Troops then crossed the Suez Canal in small personnel-carrier boats and inflatable rafts, in what became known as The Crossing, capturing or destroying all but one of the Bar-Lev forts. In a meticulously rehearsed operation, the Egyptian forces advanced approximately 15 km into the Sinai desert with the combined forces of two army corps. The Israeli battalion garrisoning the Bar-Lev forts was vastly outnumbered, and was overwhelmed. Only one fortification, code named Budapest (the northernmost Bar-Lev fort), would remain in Israeli control through the end of the war. The Egyptian forces consolidated their initial positions. On October 8, Shmuel Gonen, commander of the Israeli Southern front—who had only taken the position 3 months before at the retirement of Ariel Sharon—ordered a counterattack by Gabi Amir's brigade against entrenched Egyptian forces at Hizayon, where approaching tanks could be easily destroyed by Saggers fired from the Egyptian ramp. Despite Amir's reluctance, the attack proceeded, and the result was a disaster for the Israelis. Towards nightfall, a counterattack by the Egyptians was stopped by Ariel Sharon's 143rd Armored Division—Sharon had been reinstated as a division commander at the outset of the war. The fighting subsided, with neither side wanting to mount a large attack against the other. Following the disastrous Israeli attack on the 8th, both sides adopted defensive postures and hoped for the other side to attack. Elazar replaced Gonen, who proved to be out of his depth, with Chaim Bar-Lev, brought out of retirement. Because it was considered dangerous to morale to replace the front commander during the middle of a battle, rather than being sacked, Gonen was made chief of staff to the newly appointed Bar-Lev. After several days of waiting, Sadat, wanting to ease pressure on the Syrians, ordered his chief generals (Saad El Shazly and Ahmad Ismail Ali chief among them) to attack. The Egyptian forces brought across their reserves and began their counterattack on October 14. A division led by Major General Ariel Sharon attacked the Egyptian line just north of Bitter Lake, in the vicinity of Ismailiya. The Israelis struck at a weak point in the Egyptian line, the "seam" between the Egyptian Second Army in the north and the Egyptian Third Army in the south. In some of the most brutal fighting of the war in and around the Chinese Farm (an irrigation project east of the canal and north of the crossing point), the Israelis opened a hole in the Egyptian line and reached the Suez Canal. A small force crossed the canal and created a bridgehead on the other side. For over 24 hours, troops were ferried across the canal in light inflatable boats, with no armor support of their own. They were well supplied with American-made M72 LAW rockets, negating the threat of Egyptian armor. Once the anti-aircraft and anti-tank defenses of the Egyptians had been neutralized, the infantry once again was able to rely on overwhelming tank and air support. Prior to the war, fearing an Israeli crossing of the canal, no Western nation would supply the Israelis with bridging equipment. They were able to purchase and refurbish obsolete modular pontoon bridging equipment from a French WWII scrap lot. The Israelis also constructed a rather sophisticated indigenous "roller bridge" but logistical delays involving heavy congestion on the roads leading to the crossing point delayed its arrival to the canal for several days. Deploying the pontoon bridge on the night of October 16/17, Abraham "Bren" Adan's division crossed and raced south, intent on cutting off the Egyptian third Army before it could retreat west back into Egypt. At the same time, it sent out raiding forces to destroy Egyptian SAM missile batteries east of the canal. By October 19, the Israelis managed to construct four separate bridges just north of the Great Bitter Lake under heavy Egyptian bombardment. By the end of the war the Israelis were well within Egypt, reaching a point 101 kilometers from its capital, Cairo. In the Golan Heights, the Syrians attacked the Israeli defenses of two brigades and eleven artillery batteries with five divisions and 188 batteries. At the onset of the battle, 188 Israeli tanks faced off against approximately 2,000 Syrian tanks. Every Israeli tank deployed on the Golan Heights was engaged during the initial attacks. Syrian commandos dropped by helicopter also took the most important Israeli stronghold at Jabal al Shaikh (Mount Hermon), which had a variety of surveillance equipment. Golan heights campaign October 6-12. The Syrians had expected it would take at least 24 hours for Israeli reserves to reach the front lines; in fact, Israeli reserve units began reaching the battle lines only 15 hours after the war began. By the end of the first day of battle, the Syrians (who at the start outnumbered the Israelis in the Golan 9 to 1) had achieved moderate success. Towards the end of the day, "A Syrian tank brigade passing through the Rafid Gap turned northwest up a little-used route known as the Tapline Road, which cut diagonally across the Golan. This roadway would prove one of the main strategic hinges of the battle. It led straight from the main Syrian breakthrough points to Nafah, which was not only the location of Israeli divisional headquarters but the most important crossroads on the Heights." The tide in the Golan began to turn as the arriving Israeli reserve forces were able to contain and, starting on October 8, push back the Syrian offensive. The tiny Golan Heights were too small to act as an effective territorial buffer, unlike the Sinai Peninsula in the south, but it proved to be a strategic geographical stronghold and was a crucial key in preventing the Syrian army from bombing the cities below. By Wednesday, October 10, the last Syrian unit in the Central sector had been pushed back across the Purple Line, that is, the pre-war border (Rabinovich, 302). A decision now had to be made—whether to stop at the 1967 border, or to continue into Syrian territory. Israeli High Command spent the entire October 10 debating this well into the night. Some favored disengagement, which would allow soldiers to be redeployed to the Sinai (Shmuel Gonen's defeat at Hizayon in the Sinai had happened two days earlier). Others favored continuing the attack into Syria, towards Damascus, which would knock Syria out of the war; it would also restore Israel's image as the supreme military power in the Middle East and would give them a valuable bargaining chip once the war ended. Others countered that Syria had strong defenses—antitank ditches, minefields, and strong points—and that it would be better to fight from defensive positions in the Golan Heights (rather than the flat terrain of Syria) in the event of another war with Syria. From October 11, to October 14, the Israeli forces pushed into Syria, conquering a further twenty-square-mile box of territory in the Bashan. From there they were able to shell the outskirts of Damascus, only 40 km away, using heavy artillery. Combined Syrian, Iraqi, and Jordanian counterattacks prevented any further Israeli gains. However, they were also unable to push the Israelis back from the Bashan salient. On October 22, the Golani Brigade and Sayeret Matkal commandos recaptured the outpost on Mount Hermon, after sustaining very heavy casualties from entrenched Syrian snipers strategically positioned on the mountain. An attack two weeks before had cost 25 dead and 67 wounded, while this second attack cost an additional 55 dead and 79 wounded (Rabinovich, 450). An Israeli D9 bulldozer with Israeli infantry breached a way to the peak, preventing the peak from falling into Syrian hands after the war. A paratrooper brigade took the corresponding Syrian outposts on the mountain. 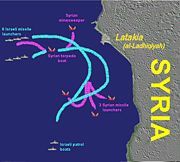 The Battle of Latakia, a revolutionary naval battle between the Syrians and the Israelis, took place on October 7, the second day of the war, resulting in a resounding Israeli victory that proved the potency of small, fast missile boats equipped with advanced ECM packages. This battle was the world's first battle between missile boats equipped with surface-to-surface missiles. The battle also established the Israeli Navy, long derided as the "black sheep" of the Israeli services, as a formidable and effective force in its own right. Following this and other smaller naval battles, the Syrian and Egyptian navies stayed at their Mediterranean Sea ports throughout most of the war, enabling the Mediterranean sea lanes to Israel to remain open. This enabled uninterrupted resupply of the IDF by American ships (96 percent of all resupply tonnage was shipborne, not airlifted, contrary to public perception). T-34/85, IS-3, T-10, T-54, T-55, T-62, and PT-76, as well as 100's of SU-100/122 (WWII vintage) Self propelled antitank guns. Super Sherman, M48, M60, Centurion, AMX 13, also about 200 of T-54, T-55 captured during the Six-Day War, and later upgraded with British 105 mm L7 gun. When the cease fire came into effect, Israel had lost territory on the east side of the Suez Canal to Egypt (shown in red) but gained territory west of the canal and in the Golan Heights (shown in green). The Security Council of the United Nations passed (14-0) Resolution 338 calling for a cease-fire, largely negotiated between the U.S. and Soviet Union, on October 22. . It called for an end to the fighting between Israel and Egypt (but technically not between Syria and Israel). It came into effect 12 hours later at 6:52 p.m. Israeli time. (Rabinovich, 452). Because it went into effect after darkness, it was impossible for satellite surveillance to determine where the front lines were when the fighting was supposed to stop (Rabinovich, 458). When the cease-fire began, the Israeli forces were just a few hundred meters short of their goal—the last road linking Cairo and Suez. During the night, the Egyptians broke the cease-fire in a number of locations, destroying nine Israeli tanks. In response, David Elazar requested permission to resume the drive south, and Moshe Dayan approved (Rabinovich, 463). The Israeli troops finished the drive south, captured the road, and trapped the Egyptian Third Army east of the Suez Canal. On October 23, a flurry of diplomatic activity occurred. Soviet reconnaissance flights had confirmed that Israeli forces were moving south, and the Soviets accused the Israelis of treachery. In a phone call with Golda Meir, Henry Kissinger asked, "How can anyone ever know where a line is or was in the desert?" Meir responded, "They'll know, all right." Kissinger found out about the trapped Egyptian army shortly thereafter. (Rabinovich, 465). Kissinger realized the situation presented the United States with a tremendous opportunity—Egypt was totally dependent on the United States to prevent Israel from destroying its trapped army, which now had no access to food or water. The position could be parlayed later into allowing the United States to mediate the dispute, and push Egypt out of Soviet influences. As a result, the United States exerted tremendous pressure on the Israelis to refrain from destroying the trapped army, even threatening to support a UN resolution to force the Israelis to pull back to their October 22 positions if they did not allow non-military supplies to reach the army. In a phone call with Israeli ambassador Simcha Dinitz, Kissinger told the ambassador that the destruction of the Egyptian Third Army "is an option that does not exist" (Rabinovich, 487). In the meantime, Leonid Brezhnev sent Nixon a letter in the middle of the night of October 23–24. In that letter, Brezhnev proposed that American and Soviet contingents be dispatched to ensure both sides honor the cease-fire. He also threatened that "I will say it straight that if you find it impossible to act jointly with us in this matter, we should be faced with the necessity urgently to consider taking appropriate steps unilaterally. We cannot allow arbitrariness on the part of Israel" (Rabinovich, 479). In short, the Soviets were threatening to intervene in the war on Egypt's side. The Soviets placed seven airborne divisions on alert and airlift was marshaled to transport them to the Middle East. An airborne command post was set up in the southern Soviet Union. Several air force units were also alerted. The Soviets also deployed seven amphibious warfare craft with some 40,000 naval infantry in the Mediterranean. When Kissinger asked Haig whether [Nixon] should be wakened, the White House chief of staff replied firmly, "No." Haig clearly shared Kissinger's feelings that Nixon was in no shape to make weighty decisions. (Rabinovich, 480). The meeting produced a conciliatory response, which was sent (in Nixon's name) to Brezhnev. At the same time, it was decided to increase the Defense Condition (DEFCON) from four to three. Lastly, they approved a message to Sadat (again, in Nixon's name) asking him to drop his request for Soviet assistance, and threatening that if the Soviets were to intervene, so would the United States (Rabinovich, 480). The Soviets quickly detected the increased American defense condition, and were astonished and bewildered at the response. "Who could have imagined the Americans would be so easily frightened," said Nikolai Podgorny. "It is not reasonable to become engaged in a war with the United States because of Egypt and Syria," said Premier Alexei Kosygin, while KGB chief Yuri Andropov added that "We shall not unleash the Third World War" (Rabinovich, 484). In the end, the Soviets reconciled themselves to an Arab defeat. The letter from the American cabinet arrived during the meeting. Brezhnev decided that the Americans were too nervous, and that the best course of action would be to wait to reply (Rabinovich, 485). The next morning, the Egyptians agreed to the American suggestion, and dropped their request for assistance from the Soviets, bringing the crisis to an end. On the northern front, the Syrians had been preparing for a massive counter-attack, scheduled for October 23. In addition to Syria's five divisions, Iraq had supplied two, and there were smaller complements of troops from other Arab countries, including Jordan. The Soviets had replaced most of the losses Syria's tank forces had suffered during the first weeks of the war. However, the day before the offensive was to begin, the United Nations imposed its cease-fire (following the acquiescence of both Israel and Egypt). Ultimately, Assad decided to call off the offensive, and on October 23, Syria announced it had accepted the cease-fire, and the Iraqi government ordered its forces home. On October 24, the UNSC passed Resolution 339, serving as a renewed call for all parties to adhere to the cease fire terms established in Resolution 338. Organized fighting on all fronts ended by October 26. The cease-fire did not end the sporadic clashes along the cease-fire lines, nor did it dissipate military tensions. With the third Army cut off and without any means of resupply, it was effectively a hostage to the Israelis. Israel received Kissinger's threat to support a UN withdrawal resolution, but before they could respond, Egyptian national security advisor Hafez Ismail sent Kissinger a stunning message—Egypt was willing to enter into direct talks with the Israelis, provided that the Israelis agree to allow nonmilitary supplies to reach their army and agree to a complete cease-fire. The talks took place on October 28, between Israeli Major General Aharon Yariv and Egyptian Major General Muhammad al-Ghani al-Gamasy. Ultimately, Kissinger brought the proposal to Sadat, who agreed almost without debate. United Nations checkpoints were brought in to replace Israeli checkpoints, nonmilitary supplies were allowed to pass, and prisoners-of-war were to be exchanged. A summit in Geneva followed, and ultimately, an armistice agreement was worked out. On January 18, Israel signed a pullback agreement to the east side of the canal, and the last of their troops withdrew from the west side of the canal on March 5, 1974 (Rabinovich, 493). On the Syrian front, Shuttle diplomacy by Henry Kissinger eventually produced a disengagement agreement on May 31, 1974, based on exchange of prisoners-of-war, Israeli withdrawal to the Purple Line and the establishment of a UN buffer zone. The agreement ended the skirmishes and exchanges of artillery fire that had occurred frequently along the Israeli-Syrian cease-fire line. The UN Disengagement and Observer Force (UNDOF) was established as a peacekeeping force in the Golan. For the Arab nations (and Egypt in particular), the psychological trauma of their defeat in the Six Day War had been healed. In many ways, it allowed them to negotiate with the Israelis as equals. However, given that the war had started about as well as the Arab leaders could have wanted, at the end they had made only limited territorial gains in the Sinai front, while Israel gained more territory on the Golan Heights than it held before the war; also given the fact that Israel managed to gain a foothold on African soil west of the canal, the war helped convince many in the Arab world that Israel could not be defeated militarily, thereby strengthening peace movements. The war had a stunning effect on the population of Israel. Following their victory in the Six Day War, the Israeli military had become complacent. The shock and sudden defeats that occurred at the beginning of the war sent a terrible psychological blow to the Israelis, who had thought they had military supremacy in the region. (Rabinovich, 497) In response to U.S. support of Israel, OAPEC nations, the Arab members of OPEC, led by Saudi Arabia, decided to reduce oil production by 5 percent per month on October 17, and threatened an embargo. President Nixon then appealed to Congress on October 18 for $2.2 billion for arms shipments to Israel. On October 20, in the midst of the war, Saudi Arabia declared an embargo against the United States, later joined by other oil exporters and extended against the Netherlands and other states, causing the 1973 energy crisis. Though widely believed to be a reaction to the war, it now appears that the embargo had been coordinated in a secret visit of Anwar Sadat to Saudi Arabia in August. The initial success greatly increased Sadat's popularity, giving him much firmer control of the Egyptian state and the opportunity to initiate many of the reforms he felt were necessary. In later years this would fade, and in the destructive anti-government food riot of 1977 in Cairo had the slogan "Hero of the crossing, where is our breakfast?" ("يا بطل العبور، فين الفطور؟," "Yā batl al-`abūr, fēn al-futūr?"). October 6 is a national holiday in Egypt called Armed Forces Day. It is a national holiday in Syria as well. In commemoration of the war, many places in Egypt were named after the October 6 date and Ramadan 10, its equivalent in the Islamic calendar (6th of October city and 10th of Ramadan city). ↑ Ynet.co.il, Document Picture. Retrieved June 6, 2007. ↑ Israel Ministry of Foreign Affairs, The Jarring initiative and the response. Retrieved June 6, 2007. ↑ Abraham Rabinovich, Shattered Heights: Part 1, Jerusalem Post, September 25, 1998. Retrieved April 24, 2007. ↑ Jewish Virtual Library, United Nations Resolution 338. Retrieved April 24, 2007. ↑ Zionism and Israel Information Center, The Yom Kippur War Retrieved April 24, 2007. ↑ The Jewish Agency for Israel, Findings of the Agranat Commission. Retrieved April 24, 2007. Heikal, Mohamed. The Road to Ramadan. Dehra Dun: Natraj Publishers, 1981. Pape, Robert. Why Economic Sanctions Do Not Work. Cambridge, MT: MIT Press, 1997. A detailed account of 1973 October War (Yom Kippur War) - From Ariel Sharon's Biography. The October War, Al Ahram supplement. The October War and US Policy—Provided by the National Security Archive. A Cry From The Bunkers—Dramatic and authentic recordings by IDF soldier Avi Yaffe from inside the IDF position, under attack at the outbreak of the war. The 1973 October War: The Egyptian Perspective—Provided By Major J.C. Moulton, United States Air Force. The 1973 Arab-Israeli War: Arab Policies, Strategies, and Campaigns—Provided by Major Michael C. Jordan, United States Marine Corps. Operation Valiant: Turning of the Tide in the Sinai 1973 Arab-Israeli War—by Major Richard L. Owen, US Marine Corps Command and Staff College. Yom Kippur War: Sacrificial Stand in the Golan Heights—by Gary Rashba, Military History Magainze, October 1998 issue. Israel Ministry of Foreign Affairs—The Jarring initiative and the response. History of "Yom Kippur War"
This page was last modified on 29 July 2013, at 13:57.